In 2012 FOBB secured funding from the Big Lottery’s Community Spaces programme, managed by Groundwork, to rescue and improve our riverside footpath below Grange Road. This path provides an important green walkway connecting Bowdon with Hale and Ashley and linking local residents to the countryside. The future of the path was threatened due to erosion of the riverbank. 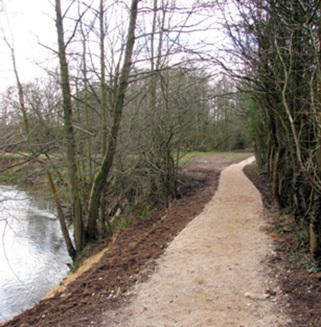 Work was carried out to restore a section of riverbank and protect the path. Thanks to additional generous funding from local donors, we were able to complete some extra reinforcement to the base and carry out more path edging beyond the main repair. The Community Spaces grant also paid for a section of the path to be resurfaced so that it can now be used all year round. An information board showing local walks and a seat were also installed. 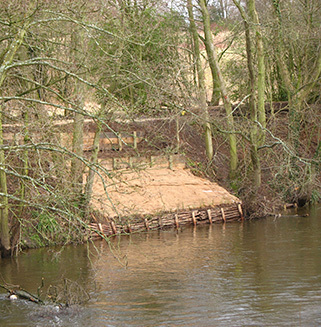 The foot of the riverbank was restored with staked brushwood faggots to trap river silt and rebuild the base of the bank. Above this, two layers of timber revetments, back-filled with compacted soil were installed. A seeded geotextile blanket covered the lower section and the overgrown hedge on the other side of the path was re-laid to allow more light through. Vegetation has now securely established itself, protecting the bank from future erosion.